Daisy flowers all season on compact plants; great for early spring and fall; low maintenance. 'Soprano' has a compact upright habit and a long flowering period beginning in early spring and continuing through the first few frosts of fall. 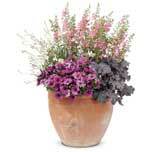 These varieties are excellent in containers and the landscape with good heat tolerance.